While the reviews at the time of its release glowed those approving, half-neon, mid-1990s shades of green and yellow, and although history has (correctly) granted it a small mountain of accolades, even internet-grade hyperbole still fails to properly contextualize its magnificence. Its technology was unique; its knowledge of the sport at once both perfect and non-existent; its genesis still somewhat puzzling. It traded realism for its own self-defined brand of realisticism. It threw away notions of what was possible, and even probable, instead building upon the flimsy foundation of the barely plausible. 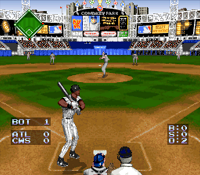 Fifteen years and four generations of gaming after its release, Ken Griffey Jr.’s Winning Run still stands, uncontested, as the first, last, and only great baseball video game. 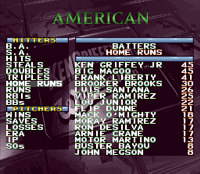 Those were not just the last days of the Super Nintendo but also the golden age of the terrible celebrity baseball game. The stony glare of Ryne Sandberg graced the box of Super Bases Loaded, visibly disappointed by the unplayable game waiting inside. Roger Clemens’ MVP Baseball threw a fastball in our collective face. 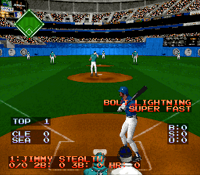 The almost entirely awful Sammy Sosa’s High Heat Baseball (only amusing, ironically enough, in Home Run Derby mode) still had a few more years to spend in the lab before ever seeing the light of day. All told, the only decent effort up to that point involved robots hitting mile-long moonshots in a vaguely dystopian yet amusingly cynical year 2020. As it was, this was also the dawn of the only real great run the namesake’s team ever knew. Given the Mariners’ abysmal history, even a rising star like Griffey would’ve been a stretch to fill any game’s cover as long as he remained on the team. But the Mariners found themselves riding high at precisely the same time the club fell into the lap of Nintendo’s then-chairman, and common sense dictated that a playing talent who was both remarkable and marketable, a suddenly elite club, and rarely available built-in marketing muscle formed as perfect a time as imaginable to strike. The times had conspired to create a vortex. Only this game could fill it. Rare Ltd., the in-house development studio tapped to create Winning Run, couldn’t secure a license with the Players’ Association, leaving the design team to fill in the gaps. The teams were there, the ballparks were there, but the game’s absent names and not-totally-perfect physics meant the players were only generally there. Given that they didn’t even have names, this wasn’t really a problem, and so a little creative sporting liberty was not just warranted but totally acceptable. True, Robin Ventura’s alter ego “Ben Vaughn” had a better handle on the outside curveball than Rockin’ Robin ever did, but the real genius of those designated fake names and avatar characters lived elsewhere. The average 15-year-old, for example, probably thought “Denny Rails” was just funny a dig at Lenny Dykstra’s “Nails” nickname or even his wiry frame; that 15-year-old, now an adult, gets to laugh and wonder how anyone ever snuck such a blatant coke reference into a kid-oriented video game. “Slash Cannon” hinted at one of the impending great moments in Seinfeld’s unexpectedly rich baseball history. Jose Canseco was “Bull Gigante” while Curt Schilling became “Snake McMillan,” although the jury remains sharply divided over the accuracy of those two. 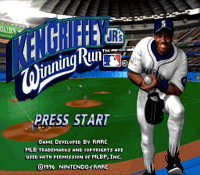 Save for Griffey, of course, favored son of the old game and personally-licensed face of this new one, his million-dollar smile adorning the box and the latest in 16-bit technology committed to drawing him in all his larger-than-life glory, the anointed Cartoon Ken Griffey, Jr. with near-superhuman abilities that—for a pre-internet/streaming video/ESPN/all-everything-all-the-time generation—seemed close enough to what they had heard Real Ken Griffey, Jr. could do. That it wasn’t didn’t matter, because all anyone knew was what they had heard of him, since there was no way for most of America, at the time, to see it for themselves. Some kid from out west. Never strikes out. Ten-foot vertical. Stole like 80 bases last year. Could Ken Griffey, Jr. turn a 104 mile-per-hour Hideo Nomo screwball into a 500-foot home run? With the two yet to cross paths in those pre-interleague days, that would have to remain a question for the ages. But could Cartoon Ken Griffey, Jr. turn a 104-mile-per-hour “Typhoon Kuroi” screwball into a 500-foot home run? Yes. Absolutely, of course he could. Later games would strive for realism, authenticity, and a chance for enthusiasts to be Just Like The Big Kids; Winning Run kept its ambitions firmly rooted in entertainment, and this allows the game and all its odd depictions to still hold up. The Cincinnati Reds and Cleveland Indians as the mightiest teams in the land? The Seattle Mariners boasting history’s most feared lineup? Throwing a runner out at first from left field? Stealing second while the opposing catcher runs to third? Sure. Why not? Even if those things haven’t rung true any time or place since, it doesn’t matter because the things that truly drove Winning Run (Indians slugger Frank Liberty, Braves ace Mike Marksman and his brother, Boston innings-eater Greg Marksman) weren’t real in the first place. If arguing with those later games, as they went to such great lengths to capture baseball as it was and as it is, can be viewed as akin to arguing with an almanac, arguing with Winning Run must mean engaging in a hostile debate over Superman’s shoe size. Years later, Sam Scorcher and Snake McMillan would suggest that half of all players actively sought outside help; Cartoon Ken Griffey, Jr., ever the optimist, at least tried to keep fun times and impending existential crises away from each other. To play it now, with the benefit of hindsight and having seen its future, is to remember things not as they had been, or even as they eventually happened, but as they were supposed to exist and become at that particular time and never, for any reason, ever again. To be reminded that even under the dimmed lights of stadiums long since demolished in near-forgotten cities, there was once plenty to celebrate. That some things once meant a subtle giggle rather than an obvious joke. That no matter how daunting it may seem, most two-out trouble can still be neutralized by simply pressing the reset button. And we can remember that time and those players not as we saw them but as they truly were: not as men at the dawn of a new era of superathletes, but as boys on a make-believe playground just waiting to be first conquered by passersby, then crushed by cartoonish supermen wearing imaginary size 13s.